A practical handbook for Shakespearean performance. For actors, directors, readers, and enlightened teachers. Hello. I’m Roger Gross and this is the website for my book, Shakespeare’s Verse: A User’s Manual for actors, directors, readers, and enlightened teachers, a valuable and practical training program for anyone interested in Shakespeare. Dr. Gross is a playwright, composer, actor, director, and teacher. 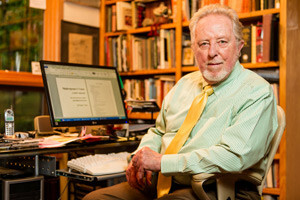 He is Professor Emeritus and former Head of the MFA Program in Playwriting at the University of Arkansas. He was Founder and Artistic Director of the original California Shakespeare Festival, President of the University and College Theatre Association, and author of Understanding Playscripts. He has directed over 180 plays including 40 Shakespeare productions. He counts King Lear and Falstaff as favorite roles.